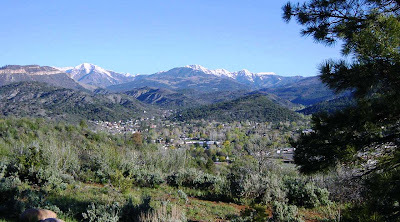 Today's posting is a view of the San Juan Mountains from the campus of Fort Lewis College in Durango, Colorado. It is sort of a transition zone from the mostly horizontal Paleozoic and Mesozoic sediments of the Colorado Plateau to the Proterozoic metamorphic rocks and the early Cenozoic volcanic centers of this corner of the Rocky Mountain chain. The town itself is surrounded by cliffs and slopes developed in the Cretaceous Mancos Shale. Coal mining took place nearby during the previous century. I just love the town of Durango. It has always been a pleasant respite from the heat of the desert on our summer field studies journeys. I would arrange for a grocery stop, giving the students a few minutes to wander about the town, getting t-shirts, and restocking their ice chests. I got to know the town even better when my son decided to pursue an Anthropology degree at Fort Lewis College. The town occupies some glacial outwash plains along a river with one of the most poetic names of any I have ever known: the Rio de los Animas Perdidos, the River of Lost Souls. It flows out of the Rocky Mountains, joins with the San Juan River, and eventually merges with the Colorado. How many places are there in the world where a 3,000 foot deep canyon with walls so steep that one cannot see the bottom from the rim is an afterthought? The Transept is one of those special places on the North Rim of the Grand Canyon. It lies west of the Bright Angel Lodge on the rim, and is a large tributary to Bright Angel Canyon. 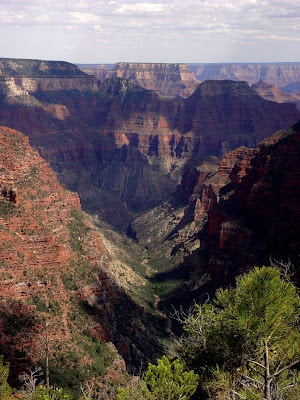 You can look down into the canyon from the Transept Trail, a short stroll between the campground and the resort, or you can get a particularly spectacular view by walking about two miles out the Widforss Trail. 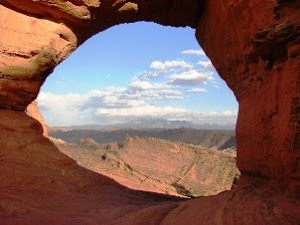 The Widforss circles the rim of the canyon, providing the view down the gorge seen in the picture above. The prominent cliffs in the lower part of the canyon are the Mississippian aged Redwall Limestone. The cliffs are about 500 feet high. The overlying redbeds are the Pennsylvanian-Permian beds of the Supai Group and the Hermit Shale. They are delta and floodplain deposits eroded from the Ancestral Rocky Mountains which existed at the time to the northwest in Colorado. I had the privilege of seeing one of the last free-flying California Condors back in the 1980's in the hills north of Santa Barbara. When the population dropped to about 28 individuals, they were all captured and they started raising captive birds. As more and more of them matured, and the total number slowly rose, they began releasing the birds in the wild in a number of widely isolated locations in California, and in their old range of Arizona. A small population inhabits the North Rim at times. At the time of my last visit, I wasn't aware of the presence of these grand birds. But I did see some monstrously huge turkey buzzards flying around and finally realized that NOBODY was identifying turkey buzzards with number tags. These were condors, in range of my camera! 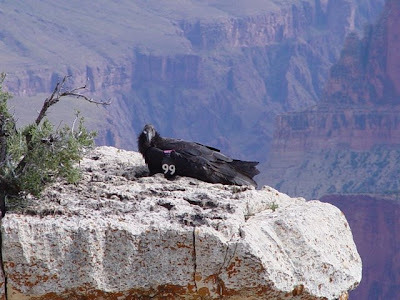 It was a neat moment, although I kept trying to get a picture without the number tag, but getting a picture of a Condor with the Grand Canyon as a backdrop was thrilling enough. What Would a Martian Do? Where Would You Land on Earth? If I were a Martian and had five spacecraft, where would I choose to put them on Earth in such a way as to learn as much as possible? I would have to start with the oceans. They cover 70% of the surface, hiding any structures in the rock, and providing an opportunity for life to arise. One of the first choices I would make is a shallow marine landing in the equatorial regions. It seems to me that vast areas of molten ice (that's how they would see it) would be mysterious and perhaps even inhospitable. I would leave it to the Martians to design a device that could explore the mysterious waters. Would it sink and sit on the bottom, or would they think to give it the mobility to explore different depths? How would Martians see the chance of life developing? They live on a cold, dry planet with liquid water a rare phenomenom. Would they pick a landscape on Earth that is most like theirs, in hope of finding life there? How about the Dry Valleys of Antarctica? It might not tell them the most about the planet, but would it confirm their pre-conceived notions about Earth and the similarities it shares with their planet? Erosional processes on Earth are clearly different from those on Mars. If I were them, I would aim for one of the boring places, such as the Central Valley of California, or the Mississippi River basin to get samples of soils that develop in depositional basins in order to learn something of the current and immediate past climate. What would they make of soil horizons? On the other hand, vast eroded areas of bedrock would present an intriguingly new landscape for a Martian. I would pick a deeply eroded, but flat terrain that reveals as much geological history as possible. With a good eroded anticline and a rover, one could work out a geological history for an area quite readily. I am thinking maybe some of the anticlines in Wyoming, or the Virgin Anticline near St. George Utah, or the Kettleman Hills in the Central Valley of California. Another erosional landscape would be one of the shield areas such as those found in parts of Australia's Outback, or northern Canada. The Martians would surely be curious about active river systems and stream erosion. There would be obvious benefits in exploring a river gorge that exposes a great deal of geology, like the Grand Canyon, but I wonder about the technological challenges of exploring such a place with an un-manned (un-martianed) craft. Finally, wouldn't they be drawn towards active volcanoes? They will have studied their own ancient shields, and understand the rock chemistry, but they never will have seen an erupting volcano. 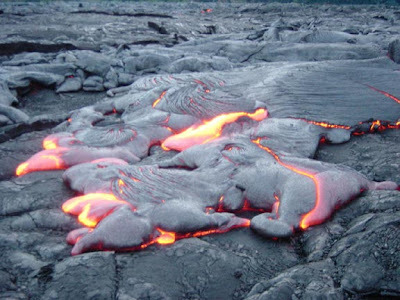 Would they shoot for the Big Island of Hawai'i, or Mt Etna? Or would our shield volcanoes seem too pedestrian? Would they go for a big stratovolcano instead? What about Cleveland or Augustine in the Aleutian Islands? Martians Coming to Study Earth! Where Would You Land? If you were a Martian, and had five chances to land a spacecraft on Earth, what five locations would you pick to land in such a way as to learn as much about the planet as possible? Imagine that you have mapping spacecraft that provide high quality photographs of the surface, but that you know no more about Earth than we do about Mars. I will give it some thought and offer my suggestions, but I haven't had time to think that far ahead. Seeing my students graduate is really great, but taking a person to a place like the Grand Canyon for the very first time is an even greater thrill for me as a teacher. We stay most years on the North Rim most years for a number of reasons. The South Rim gets something like 90% of the visitation, which is reason enough to avoid it, but because more people are there, the rim has more trailheads, more facilities, museums and so on. The North Rim, in contrast, is around 1,000 feet higher, cooler, and more moist, and thus the forest is predominantly composed Ponderosa Pine (instead of pinon), and there are more meadows. One of the nicest aspects is the location of the group campground: it is only a few hundred feet from the rim (South Rim campgrounds are nearly a mile back). I prefer the views from the North Rim; the higher elevation offers a panorama of the landscape south of the rim, including the San Francisco Peaks volcanic field. Today's picture is a morning shot looking south towards the San Francisco Peaks. I will have to leave it to others who know more about this kind of thing to explain why there is a gigantic composite volcano and associated volcanic field here. I imagine there is a sort of 'manhole' effect where lavas are leaking out from under the thick continental crust of the plateau country where it has been faulted by the current extensional regime, like a sewer system backing up. The high point on the rim, Humphrey's Peak is over 12,000 feet high (Arizona's highest mountain), but the original summit may have been several thousand feet higher. From the east, the complex looks surprisingly like Mt. St. Helens. The field is mostly Pleistocene, and at least one volcano erupted within the last 900 years (Sunset Peak National Monument). Among all the other things going on this time of year, graduations are really special. 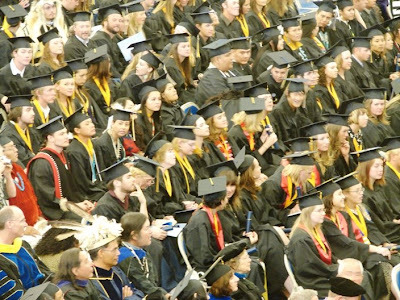 I have had the privilege in the last two or three years to see my daughter, son, and wife graduate from college, and last month, my one-week-away-from-being-my-daughter-in-law too (see my other blog if you REALLY want the details!). But it is also really special when some of your students make the big transition, especially when the odds were long, and the situations were difficult. Yesterday I was in Sacramento to see one of my former students take the walk across the stage. It was a happy moment! This is a geology blog, so I will point out that she graduated with a degree in geology. There is a grad school out there that will be lucky to have her in the program in a year or so, and later on, a company or school is going to have a very talented employee. Congratulations! Faults and Folds Weekend Fotos! Following the example of Silver Fox and Lost Geologist, I decided to throw a fault and fold foto into the geomix this weekend. This is also still on the theme of my impending Colorado Plateau journey, not because it is there on the plateau, but because this is often my first stop on our trip. It has it all for a first day geology student: faults, folds, stratigraphy, unconformities, paleontology, economic geology, and nearby archaeology. Geologists from southern California will recognize it right away as the Barstow Syncline, located within the Barstow Formation, and exposed in the appropriately named Rainbow Basin Natural Area. I did my very first field mapping here, back in 1979 or so, with Pomona College. The syncline lies near exposures of the Calico fault, an active right-lateral strike slip fault. The Landers quake in 1991 ruptured part of the fault zone. A minor offset cuts the left limb of the syncline and other faults slice through the basin, making it an excellent place for mapping. 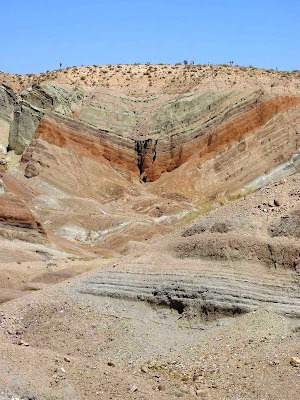 The layers exposed in the fold are terrestrial and fresh water sediments of the Miocene Barstow Formation, a critically important stratigraphic and paleontological element of southern California geology. The vertebrate fossils found here include early species of elephants, camels, antelope, three-toed horses, cats, and many others. In some nearby areas, silicified insects have been discovered as well. Because the layers of the formation are bracketed by dateable volcanic ash layers, they form the basis of the Barstovian Land Mammal Stage of the geological time scale. When similar species of animals are found in other parts of the country, they can be dated to around 15 million years by comparison to the Barstovian fauna. Looking for a good example of an angular unconformity? Check out the layer of alluvium across the top of the fold! 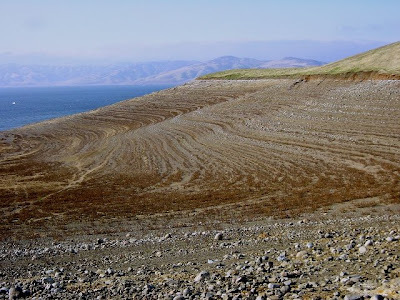 The region eroded to a relatively flat surface in Pleistocene time and was covered by alluvium, but more recently the land was warped upward and is presently being rapidly eroded. The Barstow Formation was the host rock for barite and silver ores, as well as borate minerals, and a number of mining ghost towns dot the region. Calico is the most famous, and has been developed as a regional county park (read: tourist trap), but it is a nice enough place to visit. Kenny Rogers and the First Edition once actually produced a two disk record album full of songs about the ghost town. Farther to the east, the Calico Early Man Site offers evidence for the presence of humans in the western hemisphere far earlier than is accepted by most archaeologists. Want to see Rainbow Basin? The Bureau of Land Management site offers the directions and information on camping and touring the region. Update: It didn't take long to find out that others really love the place, too (and beat me to the blog post!). Ron Schott has a blog entry here (although I am having trouble following the link), and Dave Schumaker has one here. Thanks for the info! I'm avoiding the grading of the last final exam of the spring semester by dreaming of my favorite trails on the Colorado Plateau, a place I will be exploring with a select group of students in three weeks (they selected to go on the trip with me...). Today's example is what happens when one gets onto one of the most popular trails in one of the greatest national parks. 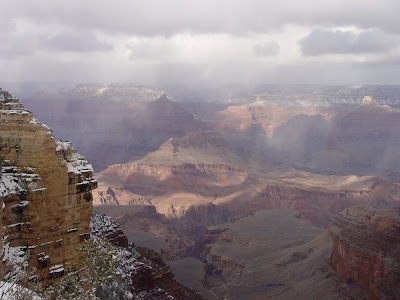 The Bright Angel Trail goes from rim to rim at the Grand Canyon, a distance of about 20 miles. I know of a few crazy nuts who tried to do it in one day (one of my close friends included), but it is not recommended, especially in summertime. I've been on about 16 miles of the trail, over two trips, and it was hard enough. 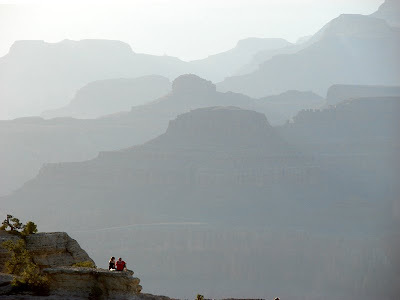 I prided myself on being able to outhike nearly all my students all through my 30's and 40's, but about ten years back, I was moving up the north rim trail so slowly, and so redfaced, that my concerned students turned back down the trail, and asked "Mr. Hayes, are you going to be ok? Can we carry your pack?". The week following the trip, I bought a gym membership and started working out. The results have been up and down, but in general I am still capable of outhiking some of my students. The secret to finding the treasures of the Bright Angel Trail is to outhike the burros. Most of the daily trips from the North Rim go to the springs about 2 or 3 miles down into the canyon. That part of the trail is dusty, full of flies, and very odoriferous. They do pay some poor soul to take a wheelbarrow down the trail, collecting "road apples". Below that point is a wonderous land. Today's picture is the passage of the North Rim part of the Redwall Limestone. I have not been on many trails that were more vertical! The Redwall Limestone is a Mississippian-aged formation that records the presence of a shallow epicontinental sea that covered much of North America. 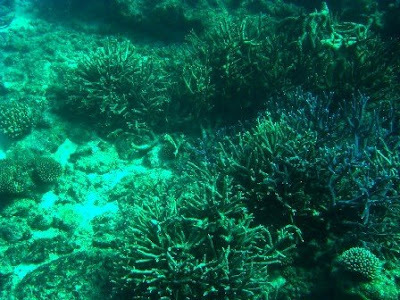 It is full of fossils, such as brachiopods, corals, bryozoans, and numerous other creatures that inhabited the warm tropical sea. The limestone is a cliff-former that is easily visible from any point on the rim. The cliffs are generally so rugged that the location of literally all rim-to-river trails in the Grand Canyon is governed by the accessible passages of the Redwall. The Redwall is not red at all, as nearly every booklet and sign tells you, but instead is gray in most places. The surface of the cliffs are coated with iron oxide staining from the overlying Supai Group. Another lesser known fact about the Redwall is the extensive presence of karst features in the layer. In late Mississippian time, the surface emerged above sea level, and numerous caves and sinkholes developed. Most were filled with intensely weathered red soils. A few caves (presumably much younger) are accessible for exploration, although most open into overhanging alcoves hundreds of feet from any horizontal surfaces. Grand Canyon Caverns are a tourist oriented attraction south of the park on the old Highway 66. One of the caves on Horseshoe Mesa has an access trail, and the exploration of that cave by myself in 1976 was one of the series of events that led to my becoming a geology major. Other caves were accessible to Pleistocene animals, and the dry conditions preserved many traces, including their droppings. The split twig figurines of the first human inhabitants of the region have been found in caves of the Grand Canyon. There are a great many beautiful sites in our parks and monuments that don't always make the travel brochures. The Observation Point trail in Zion National Park is one of those spots. It's a tough hike, but it lies near the top of my list of personal favorites. 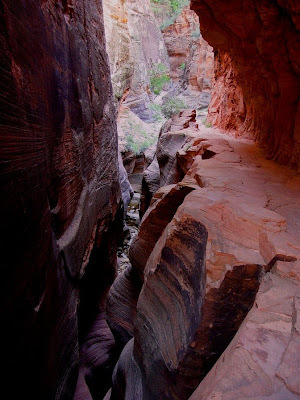 In the middle reaches, the trail levels off a bit and passes through a spectacular narrows section. The trail, for better or worse, had to be chewed out of the cliff along this stretch, given the tight squeezes in the canyon below (and probably the flash flood danger). It is a cool respite in the midst of a hot day. The crossbedding in the Navajo Sandstone provided a natural separation point to quarry the trail out of the cliff. It is incredible to imagine the dune sea that existed here in Jurassic time. The desert even included oases, as indicated by small pods of freshwater limestone in between some of the dunes. Few bones have been found in the Navajo but numerous trace fossils have been found in the unit. I am giving one more final exam tomorrow, which means I am dreaming of the Colorado Plateau journey I am taking in three weeks instead of tabulating grades. 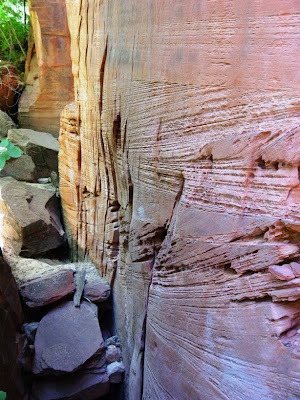 Today's picture is a nicely weathered outcrop of crossbedding structure of the Navajo Sandstone in Zion National Park. The exposure is seen along the Observation Point trail. Accretionary Wedge #8 One Heck of a Beheading! This month's Accretionary Wedge host is Julian over at Harmonic Tremors, and the theme of the month is what particular geologic event, no matter how small or large in scale, no matter how recent or ancient, is most significant to you as a scientist and an individual. As usual, I had to put a great deal of thought into the topic; and many things come to mind. One of the final exam problems I present to my historical geology students is to devise a David Letterman style "Top Ten" list of the most significant events in the Mesozoic and Cenozoic eras, and many good answers come from that exercise, including asteroid impacts, dinosaurs and dinosaur extinctions, rise of mammals, continental break-ups, and so on (my favorite is the arrival of grass, and the effect it had on mammal evolution). These are big effects, and I enjoy discussing them, but as I approach the new Wedge topic of the month, I am thinking of a smaller event that has always intrigued me. On the last day of 1996 and first few days of 1997, Central California was ground zero for an extraordinary meteorological event, a warm tropical storm that dumped feet of rain onto a record Sierra Nevada snowpack. The resulting floods were catastrophic, and quite simply are not likely to be experienced again (some drainages were described as having 250 - 500 year floods). My in-laws lived on the Walker River, an eastern Sierra river whose greatest historical flood had topped out at 6,000 cubic feet per second. In the 1997 flood, the river reached 12,000 cfs. Needless to say, many homes were washed away, and others (including my folk's) were damaged. The river channel was completely reshaped, and in many places a new channel had formed. The government decided that a river should stay put, and so the Army Corps of Engineers was called in to "put the river back" where it was supposed to be, and so I got to watch over a period of weeks as the giant bulldozers prepared the old channel to have a river in it again. The big day arrived, and right there on my father-in-law's porch I was able to watch as the dozer made the cut the brought the river back into the old channel for the first time in months. It was a marvelous sight to watch the whole river change course. Of course I had no digital camera at the time, although an old-fashioned video of the event exists somewhere out there in storage. 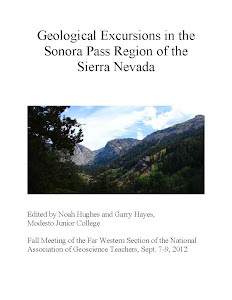 It was a great geological event (well, geological engineering event), but it is not what I am going to talk about! I became a geology major in the Grand Canyon. Literally IN the canyon, as I was on my first overnight geology field trip, and we spent five days below the rim, hiking the New Hance Trail down and the Grandview Trail on the way out. One of the details I remember the best is a discussion of the origin of the canyon itself. In those olden days of 1976, it was an unsolved mystery (I am glad it is all solved now...) but the most intriguing hypothesis, to me at least, was the stream piracy model. It posited that the ancestral Colorado River was flowing southeast towards the Gulf of Mexico, but that it was pirated by a "Hualapai Drainage" that worked its way east through the Kaibab Plateau by way of headward erosion. The part that intrigued me the most was to imagine the moment, the minute, that the Colorado River started to flow over that low divide that separated the two giant drainages, and the Colorado started a new channel that eventually gave us one of our greatest national treasures, the Grand Canyon. Imagining that moment, along with many others, made me curious enough to become a geologist and teacher. So....the most important geologic event in my life happens to be one that may never have happened. But...it could have! I have been rather brutal on climate change deniers, especially when we have a cold snap, and the letters start appearing in the op/ed section asking President Gore about where global warming has gone to, when it is freezing outside. On the other hand, after the last three days here in Modesto, I've just got to wonder. We apparently have had a grand total of three hundred-degree days in May, ever (Update: illustrating the dangers of just writing what I thought I read somewhere, this is not right; the records probably referred to the particular day in May) In the last three days we have doubled that number, and two of those days exceeded 105 degrees, which broke the old records by six and seven degrees, respectively. We have also experienced the driest March-April period ever. I think we got 0.02 inches in the whole two month period, when we would normally get 2 or 3 inches of precipitation. The snowpack, which had been very healthy across the state two months ago, is down to 60% or so of normal, so we are facing water-use restrictions. I know that one drought year and hot conditions do not constitute climate change evidence. But it does direct the attention: California has too many people, and not enough water, even in a good year. And the water we do have is in the wrong place, up in the north state, and most of the people live in the south. We have spent billions of dollars on water transfer operations and on reservoirs. The effect of global warming will be stark: we won't get less precipitation necessarily (although it may be true in southern California), but more will come as rain, and much less will occur as snow, so runoff will occur sooner, and far less water will remain stored in the high country. The officials who control these water systems know what is coming; it needs to be the job of the media and teachers like myself to make sure the public is aware, too. Sweating through a day like today definitely drives the point home. The picture, by the way is San Luis Reservoir near Pacheco Pass in the Coast Ranges. It is a primary storage facility for water taken from the Sacramento River Delta that is destined for farms in the south San Joaquin Valley, and urban users in southern California. When the reservoir is low, it illustrates contour lines very nicely! The exposed rocks are shale, sandstone and conglomerate of the of the Cretaceous Panoche Formation. It didn't take Ron Schott and Silver Fox long to figure out that the picture in last night's post was from Zion National Park. The Navajo Sandstone is a distinctive formation however you cut it (in this case, cut by the Virgin River). The trail is indeed the one to Observation Point. 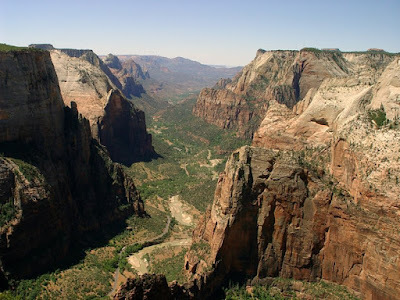 The Angels Landing Trail is a fine and spectacular challenge, especially with the chains along the upper ridge, but the Observation Point Trail is longer, and reaches the rim of Zion Canyon, unlike Angels Landing, which is the cliff in the lower right-hand side of the picture. I am tempted to give it another try this year...the trail offers stunning views all the way up, although I need to spend more time in the gym before considering it. It's been a depressing week, I guess. 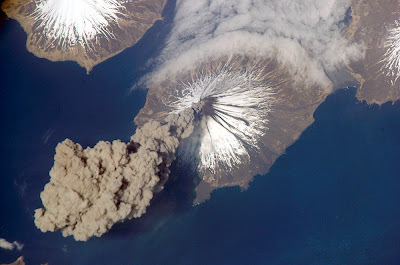 Two angry rants in a row, about geologic tragedies and stupid politicians. 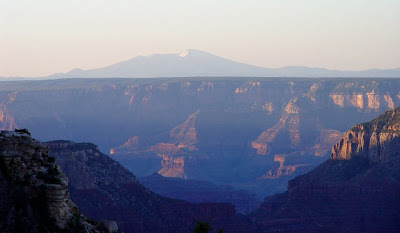 I am finding solace in that a wonderful field trip is coming up in June, and I will be on the Colorado Plateau after a too-long absence of three years. Can you figure out where this photo hails from? Two points for describing the stratigraphy, age and environment of the formation. Five points for identifying the trail, because I remember it being one of the tougher trails I have ever hiked, and I don't think many people have been on it. But what a payoff at the end! What Did You Sacrifice in the War, Daddy? I guess today's post falls under the category of geo-political rant. I remember the tales my grandparents told me about living during the World Wars (both of them!). My grandfather was never in the military, but he spent part of World War I working in a shipyard. My uncle served in the Navy in World War II, and the family did what they had to do to aid the war effort: I still have a few of the ration tickets they had at the end of the war. Ration tickets! There were severe limits to how much gasoline, meat, sugar, and other necessities a family could consume each month to make sure the troops had enough to wage the war. The entire country sacrificed, willingly or not, because the alternative was frightening: we probably never would have been invaded, but we would have been isolated in a world dominated by Nazis in Europe and the Japanese in Asia. Nearly a half million Americans would die, so that few families were left untouched by the pain of losing a family member to the conflict. Fast forward to the present day conflict in Iraq (and I fear, if the idiots in the White House have their way, Iran). A war being fought by "volunteers", for a longer duration than World War II. So many families have been financially and emotionally trapped by having a family member in the reserves, which have not been called up in decades, except for Iraq-related incidents. Soldiers being recalled to duty in Iraq, three and four times over. More than 4,000 Americans dead, not to mention hundreds of thousands of Iraqis. A horrific number of war wounded and maimed, and an incalculable future of post-traumatic stress syndrome that will affect our vets for decades. Our soldiers are serving their country admiralbly and honorably, but it seems that they are the only people who are sacrificing any part of their lives and resources. What have we been asked to do? Buy more! Show the terrorists that we consumers can continue to spend and borrow so we can have more things! Put a "support our troops" bumper sticker on our SUV's. What else? Oh yes, we can be disturbed by the images of war that we see on tv. And then turn the channel. We aren't even paying for this war. We are paying for it by credit card; our grandchildren will foot the bill for us. Did I say geo-political rant? Oh, yes. Why are we there? Would this war be happening if there weren't billions of barrels of petroleum under the sands of Iraq? Yeah, I know all those other justifications for being there: Sadaam was not a very nice person, he had weapons of mass destruction, etc., but the numbers are stark: Saudia Arabia, around 250 billion barrels, Iraq, around 105 billion barrels, Kuwait, around 95 billion barrels, Iran about 90 billion barrels. We use about 5-6 billion barrels a year in the United States. We have about 30 billion barrels in the ground. That's it. And what have we done in the last 30 years since the last gas crisis? Essentially nothing, and even worse, our vehicles have grown larger, consuming ever more fuel to get us around town for our absolutely essential errands. Detroit and Congress and the President can barely agree to slight increase mileage standards in the next ten or fifteen years. Am I angry? I guess it sounds that way. I have been keeping a count of the war dead on my office door ever since the 700th soldier died. Someone, or more than one "patriot" has continued to tear down my tally month after month, somehow irritated that we should keep in mind the sacrifice being made by our heroes in the military. I have been at it for so long, I have become numb to the numbers. They almost lost meaning to me, until this week. The idiot who occupies the White House revealed what he has sacrificed in the war effort. He gave up golf in 2003! He thought it would send the wrong message to be smacking a little white ball while good people were dying. What does he say to the fact that he has spent more time on vacation than any other president? I fervently hope that you will vote for people who will extricate us from this futile war. I hope you will vote for people who will design an energy plan that plans for a future beyond the two years or four years to the next election. I hope you will vote for someone who can truly call on us and inspire us to sacrifice something of our lives so that there will be something for the children who come after us. Work now to make your own life a commitment to a greener future. And the next time a politician, or a columnist, or a talking head on television tries to justify a war, make sure that they have their children on the front lines of the conflict. Because that can be the only measure of sacrifice that can justify taking sons and daughters away from someone else. In the past four years, I have reported several times about the incredible spike in tropical storm activity. Time and time again records have been shattered. Global warming can't be an explanation for the upsurge we are seeing today. Cyclone Nargis had all the makings of a perfect storm. Packing winds upwards of 120 mph, the cyclone became one of Asia's deadliest storms by suddenly going from Category 1 to Category 3 and hitting land at one of the lowest points in Myanmar. The storms seem to be intelligently guided to inflict maxim (sic) damage [italics mine]. If they were random, the law of averages would cause most to strike uninhabited areas or follow paths that lead to the open ocean. There are many more quotes, and many more sites like this on all of these events, and the Rapture Index has been played for laughs on some websites. But a great many people pay attention because once again, the magnitude of some of these events is incomprehensible (while others, like gas prices, are irritating, but they are a symptom of a very serious coming problem of resource scarcity). Humans have always looked for an underlying cause, whether it is the anger of the gods, or the movement of massive plates, or the warming of the climate. Scientists use more sophisticated tools these days compared to divining rods and tea leaves, but we still try to explain those things that are unexplainable. Fair or not, many people see scientists as simply one more kind of priestly class that explains the mysterious, and our pronouncements are to be considered, and then "believed", or "not believed". So, if you are from a non-scientific background, and you are wondering if we are entering "the last days", I ask you to consider that many of these disasters are the natural consequences of ever more and more people living in marginal and dangerous places. The earthquake in China happened at the margin of a violently active geological fault zone. Overpopulation and lack of arable lands inland lead to too many people living in hazardous coastal areas, subject to hurricanes and typhoons. Sometimes these disasters do happen nearly simultaneously, it is the nature of randomness. And some events are unusual. But there are verifiable reasons. Global warming is real, and it is having profound effects on our environment and our weather, so we are living through strange times. But we are the cause of the warming. This is not something to have an opinion about, it is not a political issue, even though some have caused it to become one. Another perspective (from a non-western view) on this subject can be found here. Distracted from Yosemite? How in the World? I am in a no-person's land between the last of the finals at my main school of employment, but the last two weeks of my part-time position at the local university, and starting the first day of the summer session. And my son will be married in three weeks. My heart is in my work and with my family, but I am getting distracted just the same by realizing that summer is coming before long, and that means my summer field studies class is suddenly on the horizon. I have been enjoying sifting through my Yosemite region photos, but that coming horizon also includes some wonderful places. 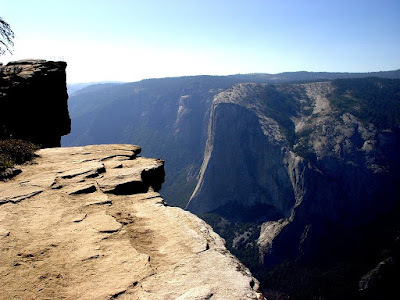 If the last few entries in the Yosemite series have left you with a fear of cliffs and steep drop-offs, I suggest today a slightly different point of view. Between Taft Point (7,500 ft) and Glacier Point (7,214 feet) stands the barren expanse of Sentinel Dome, which at 8,122 feet is one of the highest easily accessible points on the rim of Yosemite Valley. The normal hike (a bit over a mile) begins at the Taft Point parking area, although anyone who is savvy with a topographic map will note the presence of a service road about 2/3 mile northeast on Glacier Point Road that vastly shortens the hike (maybe a half-mile or less). Unlike the previous viewpoints, the exfoliated dome is set back from the rim, and although there is a short stiff upgrade at the end, there is no place to fall off of. 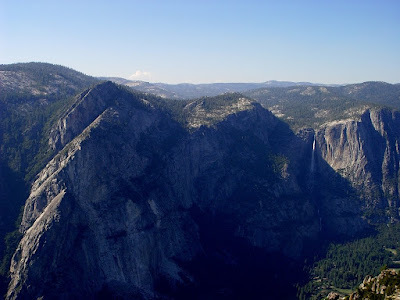 The summit of Sentinel Dome seems to be an outlier of El Capitan granite, although it is surrounded by the granodiorite of Kuna Crest and the Sentinel granodiorite. The view from the summit of Sentinel is superb, although it reveals little of the valley floor. Instead, it provides a sweeping view of the valley walls and the surrounding region of glaciated peaks, cirques, aretes, domes and cliffs. It stands only 700 feet shorter than Half Dome. It is visible from the classic view of Yosemite Valley, just behind the lowest of the Cathedral Rocks, and just to the right of Sentinel Rock. Today's picture is looking west towards the portal of the valley, framed by the Cathedral Rocks and El Capitan. The granite that forms both of these edifices is mostly unjointed, and the glaciers that scoured the valley were unable to quarry deeply beneath the cliff faces. The sediment between the portal cliffs is only about 300 feet deep. At the upper end of the valley, in the vicinity of the stables and Stoneman Meadow, the sediments may be as much as 2,000 feet thick! One may notice the near lack of cliffs beyond the portal formed by El Capitan and Cathedral Rocks. These are the Rockslides, and are composed of diorite of the Rockslides, which is Jurassic-Cretaceous in age, somewhat older than the other rocks in the valley. The rocks have been intruded by mafic dikes and joint more closely than other plutonic rocks in the valley, causing them to easily break down and form talus slopes. Roads built across this slope have been abandoned over the years due to constant rockslide damage. Well, perhaps you have seen this view, if you have been to Yosemite. 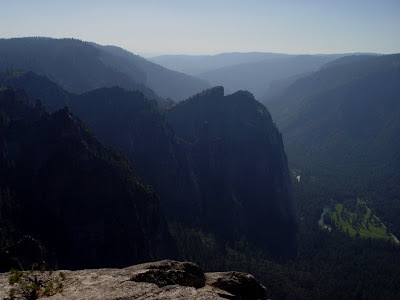 It is the view up the Merced River Canyon above Yosemite Valley, as seen from Glacier Point. The two waterfalls are the justly famous Nevada Falls (upper, 594 feet) and Vernal Fall (lower, 317 feet). Because they are on the Merced River, they have the virtue of not drying up in the late season, although they can shrink to insignificance in a dry year. 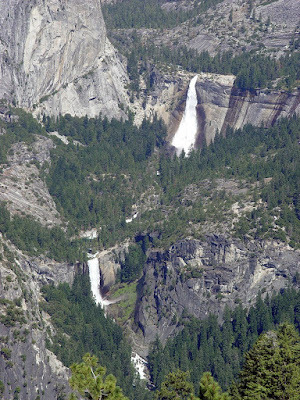 The falls have formed along prominent joints in the Half Dome granodiorite. The glaciers moving down the valley plucked at the more jointed rocks down-canyon, forming these glacial stairsteps. The hike to Vernal Falls is one of the most popular hikes in the park. In the early season, hikers will end up entirely drenched from the spray from the base of the falls. Unfortunately, there is an utterly beguiling green pool of water just upstream of the the fall that just begs to be soaked in on a hot day...it is fun right up to the point that one gets caught in the current and gets swept over the brink. Believe the signs and find somewhere else to swim! 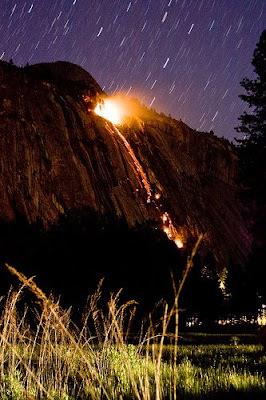 Since I posted on the subject of North Dome this afternoon, this spectacular photo was posted at http://www.yosemiteblog.com/2008/05/07/firefalls-2008-let-the-fire-fall/ and there is a link to others. It is amazing what some people can do with digital cameras! Photo by Edie Howe-Byrne via Flickr. Today is the four-month anniversary and the 100th post on Geotripper! I wasn't really sure what it was going to be like, and whether I would be able to keep the site active with all of the other stuff going on in my life as a college teacher, but I have made it work by allowing myself a blog entry as a reward for finishing a pile of grading. And there are always piles of grading! But I have enjoyed sharing my photographs and opinions, and I have especially appreciated the positive feedback that I have received from the geoblogosphere. I enjoy being a part this interesting group of earth scientists, and I hope to see more of the students and teachers out there getting involved! It was far easier to start a blog than I thought it would be and it has been rewarding. Now I will have to see if I can make it all the way through a year! Today's view of the abyss comes from a familiar tourist stop: Glacier Point. It is accessible by paved road and trail, and is visited by hundreds of thousands of people every year. It is easily one of the greatest scenic vistas on the planet. 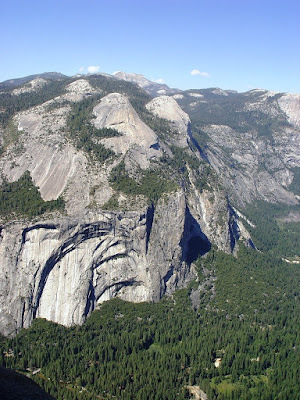 The view is dominated by Half Dome and the Tenaya Canyon, as well as the cliffs around Yosemite Falls. Between the two is an interesting view of a pair of exfoliation domes called North Dome (left) and Basket Dome (right). From the valley floor they are barely visible above Royal Arches and Washington Column. Exfoliation takes place when the weight is removed from homogeneous rock like granite, and the rock expands. It fractures parallel to the surface and this leads to a tendency to remove corners and edges of otherwise rectangular rocks. A great many domes grace the Sierra Nevada, and a vast number of them have never been touched by glaciers. The mountain on the skyline is Mt. Hoffman, which is a high peak close to the geographic center of Yosemite National Park. N. King Huber used the view from the summit as the springboard to a discussion of the geology of the park in his excellent Geologic Story of Yosemite National Park. It is a great hike, and is likely to be the subject of future posts. If you go back to my original post and series debut of the under-rated places of Yosemite Valley, you will remember the classic view of Yosemite Valley from the Wawona Tunnel exit. This picture is looking west from Taft Point on the rim of the valley back towards the Tunnel View, with the Cathedral Rocks and Spires forming the dominant cliffs in the center of the photo. El Capitan Meadow is visible on the valley floor. One of the most prominent Tioga Stage glacial moraines lies just west of the meadow. It dates to about 13,000 years before present. For thousands of years, natural wildfires and intentional burnings by Native-Americans cleared the conifers from the valley floor, and over time it evolved into an open oak woodland with wide meadows and a few widely scattered conifer trees. The size of meadows in Yosemite Valley has dramatically decreased in the past century. Josiah Whitney and his crew calculated meadow area in 1866 to be 745 acres. By 1937, meadow area had dwindled to 327 acres. Today, meadows cover 65 acres, leaving only 6.8% of the original 1866 meadow area. With the advent of national park status, fires were suppressed and the shade-loving conifers flourished. The forest is now dense with young trees, and the possibility of disastrous wildfires is very real. The distant skyline shows the relatively gentle westward slope of the mountain range, leading into the Central Valley. The mountains have risen by fault motions on the eastern margin of the range, leading to a westward tilt that has mostly developed within the last 9-10 million years. Today, the view from the edge of the abyss (again from Taft Point) is to the north, towards Three Brothers and Yosemite Falls. Jointing plays a prominent role in the scenery of this view, both in the diagonal joints that form the western slope of the three spires of the Brothers, and in the horizontal joints that provide the two steps to the falls of Yosemite Creek. The rock on the right side of the Brothers is the Sentinel granodiorite, described earlier here, while the rocks on the left is the El Capitan granite, described here. Jointing occurs as removal of the overlying rocks by erosion releases pressure, and the rock expands and fractures. It provides an avenue for water to enter the interior of the rock face and start the chemical weathering process, leading to the loosening of the boulders in the cliffs. The Three Brothers, with their intersecting joint sets, are a constant rockfall hazard. The white scars are recent slides and falls, including the 1987 Middle Brother slide, which with an estimated volume of 600,000 cubic yards, was the largest historic mass wasting event in the valley. Luckily, the National Park Service had closed the road below in anticipation, and no one was injured in the event. 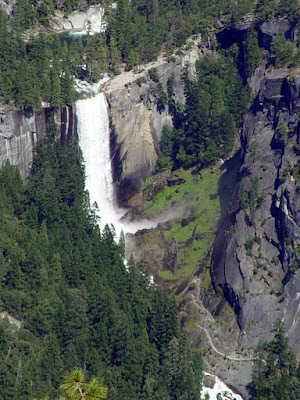 Other rock falls have produced injuries and deaths, including on the nearby trail to the top of Yosemite Falls. Yosemite National Park is simply one of the most extraordinary landscapes on the planet, and I have been trying for several weeks to highlight some of the lesser-known parts of the valley, the kinds of places that the average visitor might overlook while staring at the more famous wonders in stone and water that grace the park. Today I am starting a journey to a different place, the rim of the valley. 90% of the visitors to the park congregate on the valley floor, and a significant number of them drive the paved road to Washburn and Glacier Points. These two sites must be some of the most spectacular viewpoints in the world, and a visit to Yosemite is not complete without stopping at both of them. If you are visiting Yosemite anytime soon, the road has just been opened. Still, they are crowded, noisy and fences and paved trails make it clear where you have to go. There is nothing quite like standing on the brink and staring into the abyss below, alone, with nothing between you and the whole expanse of cliff and valley floor but empty vast space. I am only beginning to discover those places. 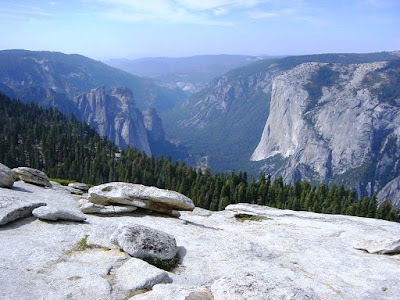 Today's pictures are taken from Taft Point, a viewpoint at the end of an easy one mile trail. Although the trailhead parking lot is often full, when I was there I saw only 3 or 4 other people on the trail, and I had the clifftop view all to myself (I think most people must have been climbing Sentinel Dome; more on it later). 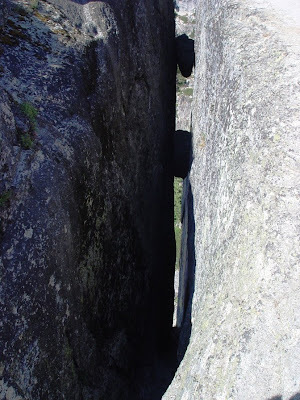 Yosemite Valley is abrupt. There is no other way to put it. One walks through a gentle landscape of soil and forest, the occasional outcrop of weathered granitic rock, noticing flowers and greenery. A few steps later comes several feet of barren horizontal rock, and then suddenly the world falls away into oblivion. The land is of two ages. The flatness is old and gentle, ancient and unglaciated, a hint of the shape of the land before the mountains began their long and relentless rise into the sky. The other is youthful, brash, a place of action and change. First carved by river, then undercut by glacier, and shaped finally by mass wasting, the cliff is a temporary adjustment, a stand off between shear forces, friction and gravity. It is hard to stand on two feet and look over this edge; the feeling is to crawl towards the cliff, a form of supplication to the vast forces at work here. The cliff across the valley in the picture above, if you don't recognize it, is El Capitan, the 3,000 foot-high cliff that dominates the west opening to the valley. The chockstones in the photo below have dropped into the Taft Fissures, joint openings caused when the previously deeply buried granitic rock expanded and cracked. The drop-off below the fissures is thousands of feet. I kind of started this photo-essay about Yosemite Valley by promising myself that I wouldn't be showing the hundreds of pictures that I've taken of the most familiar sights in the park, like El Capitan, Half Dome, and Yosemite Falls. They've been photographed literally millions of times, and it takes some originality and creativity that I don't have as a photographer to make the views unique. On the other hand, I had an extraordinary night in January of 2005. I was staying at Yosemite Lodge for the first time ever on a nice mid-week discount rate through the Yosemite Association. We couldn't sleep, and I knew the moon would be rising at 11 o'clock or so, and so we got in the car and saw Yosemite Valley the way few others do...in the dark on a frigid winter night under a nearly full moon. The camera I had was not versatile enough to allow the spinning of the stars, but a 30-second exposure was enough to bring out the ghostly details of Yosemite Falls with a star-studded sky above. 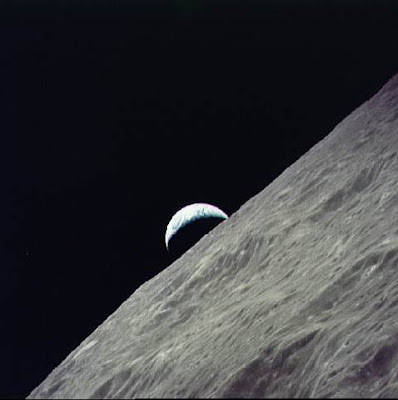 No particular aspect of geology to discuss today, aside from pointing out the fact that we live in an extraordinarily beautiful world, a single unique planet wandering through the cosmos. It is a place of wonders. It was cold, I was shivering, but there was not another soul moving on the valley floor that night. We had the entire place to ourselves. How many times will that ever happen in this lifetime?